Disney has been getting ready to roll out their Magic Bands in Walt Disney World. They have been playing with RFID technology for a few years now. The concept of an armband that would access all kinds of vacation experiences for the guests has been long talked about. The Magic Bands do an amazing job of that. Our Laughing Place Travel has had several clients beta test the Magic Bands. I have found my clients have enjoyed taking part in the test. They were excited to try Magic Bands. I found the system worked well for most people. Even folks that were not as computer savvy were able to work with the online program to access their Magic Bands. To access Disney Magic Bands you will need a Disney log on. You will also need to access My Disney Experience. My Disney Magic Bands ~ How Do I get Them? The Disney Magic Bands are tied into My Disney Experience. Disney would like you to acquaint yourself with My Disney Experience. That is where you will find out if your Disney reservation has been chosen to beta test Magic Bands. My Disney Experience puts your vacation plans at your fingertips. You can Google My Disney Experience. A web link will pop right up for you. Once you are logged on you can enter your Disney resort reservation number. You can also enter all your dining reservation numbers. All your itinerary plans will be in one place. My Disney Magic Bands ~ How Do They Work? I admit there has been some trepidation about the Magic Bands. I understand people are concerned about security and Disney knowing everything about them. I think that is already a given. How do you think Disney mails out pin codes? They look at geographics, and keep track of guests who have visited different Disney destinations. I believe the Magic Bands make things more secure for us. You wear the Magic Band on your wrist. It is very light weight. You will not have to fumble for your ticket or room card key anymore. Your resort charging privileges will be on your Magic Band. 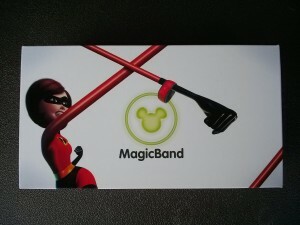 The Magic Band will be your room key. Guests will just wave it in front of your door and it will unlock. 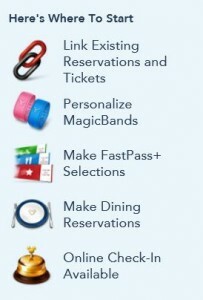 The Magic Band will have your theme park admission loaded on it. You will just wave your arm by the special podium to enter the theme parks. The best part is the Fast Passes! 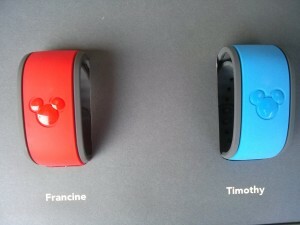 You can arrange your Fast Passes at home before you travel with Magic Bands! I am beta testing the Magic Bands in September. Take a look at how I describe my Disney Magic Bands. Previous PostDisney Dining Updates ~ Disney WorldNext PostDisney World Relaxing???? Mine came in the mail today 😀 Fancy shmancy! What color did you pick, Ahnalira?